In 1966, the popular Carry On British comedy film series finally took a stab at the world of Hammer horror with Carry On Screaming! . Now, I’ve heard about the Carry On series for years but I’ve never had a chance to watch one. They never aired locally when I was growing up and even TCM didn’t really pay attention to them until recently. However, I know that my British and Australian horror and comedy fans are well aware of this series. The response is always mixed so I went into Carry On Screaming! with some excitement and a bit of trepidation. First, it’s important to know a little about the Carry On series. It actually consists of 31 films made between 1957 and 1992. There were also three Christmas specials and a television series, not to mention several stage plays. Those facts alone surprised me and really made me wonder if I had been missing something huge. I enjoy British comedy, which is a prerequisite to even approaching any of these films or TV shows. I was also amazed to learn that these films actually had a regular cast of actors. What’s even more amazing is that most of the cast remained intact for the first 30 films, spanning 1958 – 1978. Only three actors from the series proper came back for the final film, Carry On Columbus, in 1992. Generally panned and often voted as the worst British film ever made, it’s safe to say that the Carry On series is indeed finally finished. 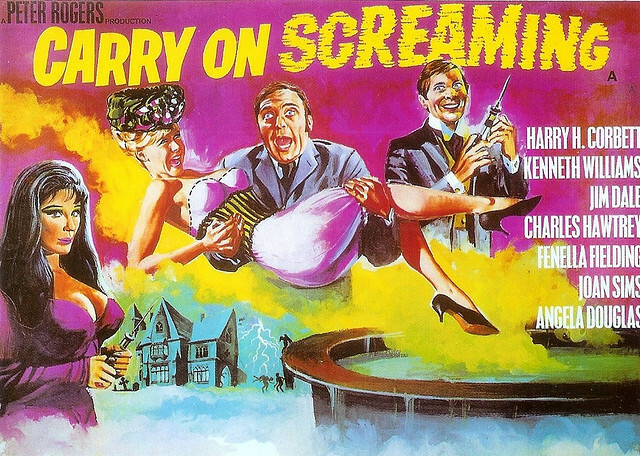 In 1966, at the height of Hammer horror supremacy in the theaters, we were given a full on parody with Carry On Screaming! Visually, the film nails it with enough mansions and forests surrounded by mad scientists and local constables to lure you in. We have the evil yet seductive Valeria (Fenella Fielding) working with her brother Dr. Orlando Watt (Kenneth Williams), who is in need of electrical charges to stay alive. Their monstrous servants the Oddbods are seeking victims while Detective Sergeant Bung (Harry H. Corbett) is in hot pursuit while also having to deal with a jealous and nagging wife (Joan Sims). Throw in a creepy butler, a Mr. Hyde character and a mummy, and you have all of the makings for a fun horror parody. And, of course, you have to have a man in drag for the proper British humor effect. 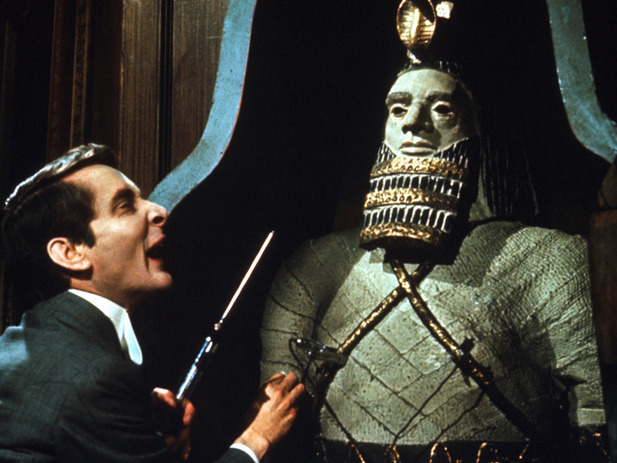 Because of its horror theme and homage to Hammer, Carry On Screaming! was one of the most popular films in the Carry On series. I sometimes bristle at beloved films or TV shows being the victim of parodies but in this case, I think they really did Hammer justice. I found the scenes and the running phone gag between Bung and his wife to be perfect comedic bridge sequences in the action and main storyline. The theme song started things off on a worry some note but I felt more at ease once I got my first glimpse of the monster on screen. It was only the second time the series attempted this and the last time until 1978, probably all the better. 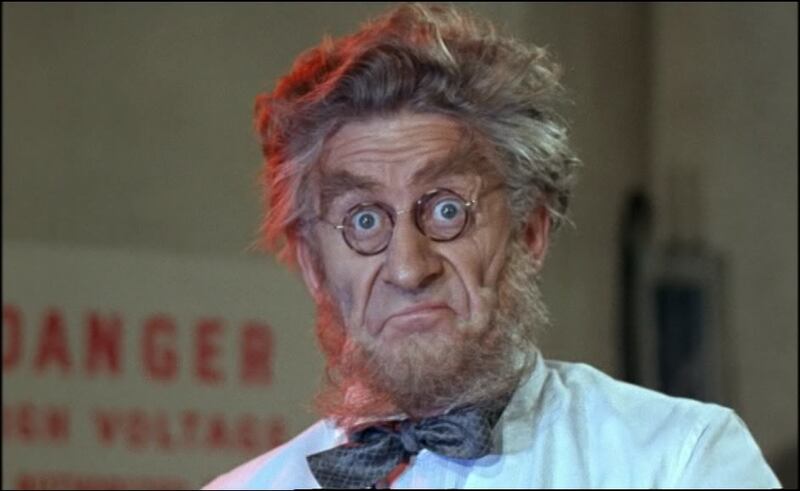 It was fun to see Jon Pertwee in a small role as Doctor Fettle. Four years later, Pertwee would take a turn at another doctor in Doctor Who. As he is still my favorite Doctor to date, I always enjoy seeing him in other roles and here he is clearly mugging it up with crazy visual expressions. Well worth it for old school Doctor Who fans. I’m definitely up for more Carry On films and I’m very open to suggestions from readers. You can find the Carry On Screaming! trailer on YouTube easy enough along with an interesting 1998 documentary on the series. Beyond that, do some searching online as some of the films are available on DVD. However, Carry On Screaming! has only been released once in the US and that was as part of a collection in 2002. Now long out-of-print, you’ll need to open your pocket book for that one. It was released in the UK but buyers beware as you will need a region free player for that version. Thankfully, TCM recently broadcast it so there is always a chance it could pop up again. However you acquire it, if you are a Hammer fan, I think you’ll enjoy it. Just mention the name Bert I. Gordon and images of cyclops and giant men immediately come to mind. He may have only 23 films to his credit but he clearly left his mark on impressionable young monster kids everywhere. But even the best of the best can have an off day and that may very well be what happened with Picture Mommy Dead (1966). It’s important to remember that we were just six years removed from the classic Psycho when this film was released. Everyone was trying to have their Hitchcock moment, most with little success. So it comes to no surprise that Mister B.I.G. himself would attempt to do the same with Picture Mommy Dead. The plot revolves around young Susan Shelley (played by Bert’s daughter Susan) witnessing the death of her mother Jessica (Zsa Zsa Gabor, Queen of Outer Space). Surviving a fire, it sent her into a state of shock. After three years in an asylum/convent supervised by a nun, she is released into the custody of her father Edward (Don Ameche, Coccoon). The problem is she thinks her father killer her mother and, once she starts seeing images of her mother, the question of her sanity comes into play. Add Edward’s new cheating wife Francene (Martha Hyer) into the mix, the lure of wealth and mysterious late night lurking’s reminiscent of an old, dark house, you have the recipe for something fun…right? The problem with Picture Mommy Dead really centers on the performance of young Susan Gordon. She plays a key role and a better actress might have really stolen the film. Unfortunately, Susan Gordon simply wasn’t up to the task. She may have been cute when she was younger but here she comes across as awkward. Not surprisingly, she had one more guest role on TV after this film and she was gone from the screen. The rest of the cast put in good performances. In particular, I loved the over-the-top craziness of Wendell Corey as Mr. Clayborn the lawyer. 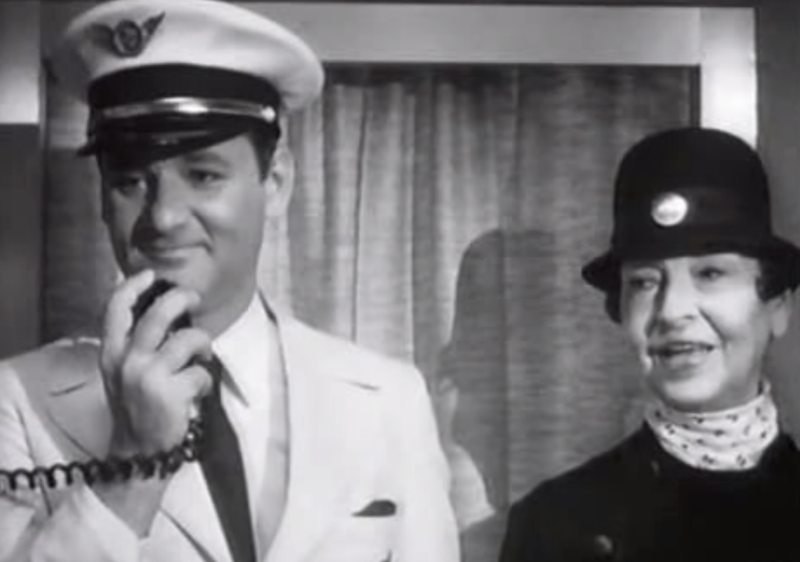 His one-liners against young Susan are classic and make it well-worth checking the film out, at least for those scenes. Picture Mommy Dead looks beautiful in living color due in part to the location shots at the Doheny Mansion in Beverly Hills. It is also full of cool imagery, such as the bleeding portrait or the crazy melody young Susan sings over her dying mother’s body. Unfortunately, I just can’t get beyond the poor acting of Susan Gordon. The role of Jessica Flagmore Shelley was originally to be played by actress Gene Tierney but she had retired prior to the start of the film. Tierney had suffered from depression for many years and had more than one stay in the Menninger Clinic in Topeka, KS. On an interesting side note, my sister and brother-in-law now own that once out-patient home and even know the room she lived in. Tierney was married to Texas oil baron W. Howard Lee at the time of filming, who had previously been married to actress Hedy Lamarr. Ironically, Lamarr was offered the part of Jessica after Tierney turned it down. She even started filming but was quickly fired after she collapsed on the set from nervous exhaustion. She hadn’t starred in a film since 1958 and this would have been her comeback. Unfortunately, that comeback never did happen. 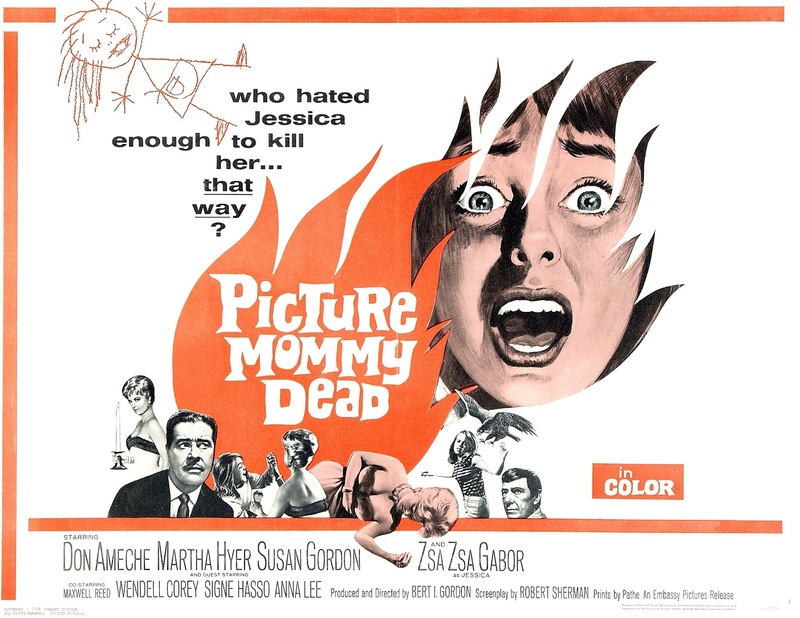 TCM recently offered a rare broadcast of Picture Mommy Dead. There is an apparently out-of-print and rare DVD selling for as much as $95 on Amazon. The film is certainly not worth that kind of ridiculous investment. Thankfully, it is currently available on YouTube. It is certainly worth checking out and you’ll have fun while you do. I just think it could have been better than it turned out to be. Sometimes you find yourself going to a movie theater with no clue what you are going to see. You might recognize the random title or actor but the plot of the film escapes you. You haven’t seen the trailer and you haven’t read one online review. Now, this used to be much more normal than it is today. In today’s world, you have the opportunity to know the entire film plot including post-credits scenes and deleted content before you taste one kernel of popcorn. So being surprised in a movie theater can be a pretty cool experience and that is just what happened with Beyond the Reach (2014). Michael Douglas (Ant-Man) stars as the corporate big league player John Madec. John has arrived in the Mojave Desert to hunt bighorn sheep. He’s all about adding trophies to his collection, flashing around his European all-terrain vehicle (complete with mini-bar and microwave) and state-of-the-art rifle. After paying the local sheriff off since he didn’t have the proper hunting license, he hires young Ben (Jeremy Irvine, The Woman in Black 2: Angel of Death) to guide him. However, after Madec accidentally shoots the old prospector Charlie, Madec offers Ben a payoff to avoid scandal. He’s getting ready to close a huge financial deal and he can’t avoid the negative publicity. But when Ben’s conscience gets the better of him, an intense game of cat and mouse begins. With temperatures reaching 130 degrees and no water, can Ben last long enough to outwit the crazy Madec and avenge his friend’s murder? Michael Douglas turns in an awesome performance as the nutcase Madec. Early on in the movie, it’s almost like we’re seeing his Wall Street character Gordon Gekko in a new desert local. At 70 years old, he closely resembles his father Kirk Douglas, now more than ever. He does eventually turn the corner and dips into the over-the-top pool just a little but never at jeopardizing the movie. This is his showcase as the supporting cast is, admittedly, a little weak. Jeremy Irvine actually does well when he’s sharing the screen with Douglas. However, his immaturity as an actor tends to shine through a little when it’s just him up on the screen. But that also goes well with the development of his character. Ronny Cox (Robocop, Total Recall) does a good turn as the sheriff, for what little that role offers. Ben’s girlfriend Laina is played by young actress Hanna Mangan Lawrence. Honestly, she comes across as very flat. While her role isn’t big, a better actress could have made that character come to life in ways Hanna never does. This intense thriller is actually based on the 1972 novel Deathwatch written by Robb White. He was in his 60s when he wrote the novel and died in 1990. What isn’t being publicized is that it is also a remake of the 1974 made-for-TV flick Savages, which featured Andy Griffith in the lead role as Madec. Beyond the Reach has obviously been updated as a satellite phone, which plays a key role in this new film, was not a plot device in the novel nor the original movie. And Hollywood has had to throw in a jump scare or two into the mix for good measure. Whereas the novel and TV movie focused on people not believing Ben’s story once he returns, that plot point is glossed over in favor of a somewhat surprising ending. Yes, Madec’s return is somewhat typical clichéd Hollywood but I honestly didn’t think they would go for that here, so it did surprise me. I also got hints of The Most Dangerous Game with a little bit of Duel. Man against madman against the desert setting. Simplistic and stark, which works quite well. 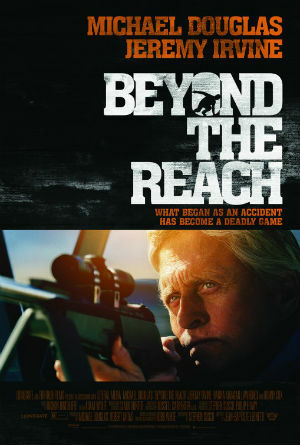 Beyond the Reach was a pleasant surprise and one that I recommend. It made some festival rounds last year and is now playing in limited release, so it may be hard to find in the theaters. However, you can rent it on Amazon Instant Video or iTunes and a DVD release is planned for June 16. Check out the trailer for yourself and watch it whenever and however you can. I for one will not be making any trips to the desert any time soon. The one problem with being a film collector is that you soon reach a point where you think you’ve seen everything you could possibly want to see. However, as any true film collector will also tell you, that is nearly impossible. There’s always a rare gem or a horrifically bad flick just waiting to be unearthed. And sometimes you find something in between. 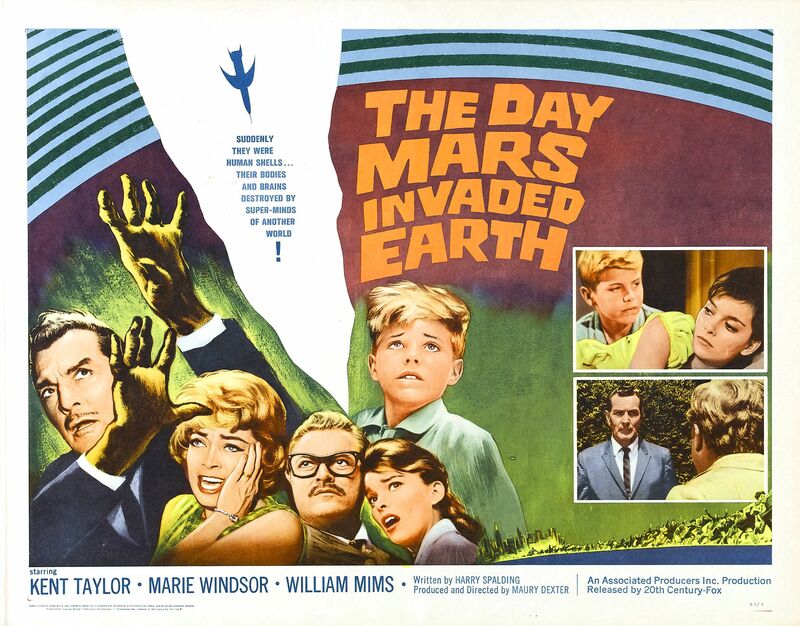 Such is the case with The Day Mars Invaded Earth (1963). With such a title, a viewer might expect to find something along the lines of War of the Worlds or The Day the Earth Stood Still. What you actually get is more in tune with Invasion of the Body Snatchers. 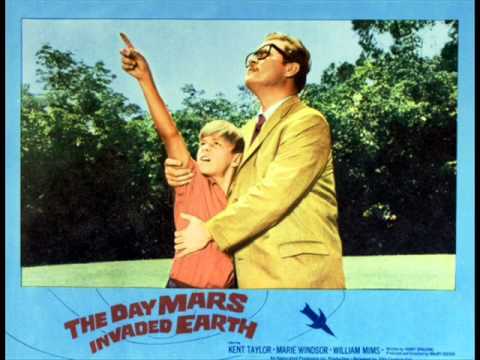 That’s not necessarily a bad place to start but the comparisons start flowing early on and, ultimately, hurt the film once you realize The Day Mars Invaded Earth isn’t quite in the same league. Kent Taylor stars as Dr. David Fielding, a scientist in charge of a space probe mission to Mars. We see early on that he loves and misses his family but his work always comes first. While alone in his office, a strange glow appears around his head and then vanishes. He remembers nothing except that his is tired. He agrees to go visit his wife Claire (Marie Windsor) and children Judi and Rocky. They are staying in a house next to a big mansion (the legendary Greystone Mansion). It is here that David discovers what is really happening. Odd occurrences begin to mount up. David sees his wife, who doesn’t respond to him, only to confront her later where she couldn’t possibly be that quickly. Yes, the Martians have landed and they are assuming human form. However, it isn’t so much an invasion as it is to ensure that humans stay away from their home on Mars, essentially sabotaging all future exploration efforts. The scientist in David resists even as he confronts a version of himself who explains the futility of resistance. He soon sees his duplicate family and knows they must be stopped. With the help of friend Dr. Web Spencer (Williams Mims) is there still time to thwart their plan? I personally loved the overall concept behind the film. It was an interesting story that really doesn’t have anything to do with bug-eyed aliens (which is always fun too) but more with a race simply wanting to be left alone. It has a good script that moves fairly quickly along due to the 70-minute running time and the filming location enhances the movie. 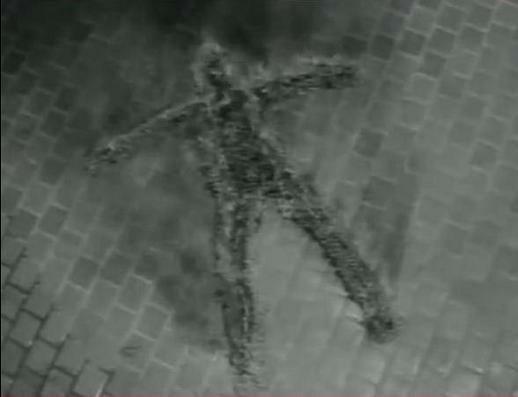 There are few special effects but the burned remains are kind of cool. Unfortunately, where the film suffers is the cast. Kent Taylor had 150 credits to his name, most notable for his lead role in 58 episodes of the Boston Blackie TV series in 1951-1953. However, he was not the most charismatic man. A better actor would have made it a better film. The same can be said for the rest of the cast. They seem to do the job but they lack the acting chops to help elevate this film beyond average and forgettable. This fact alone explains why the film has been generally forgotten. Director Maury Dexter is also known for his work on House of the Damned (1963), best remembered for a young Richard Kiel. His career ended in 1983 after a long stint with the TV series Little House on the Prairie. Writer Harry Spalding has a few more sci-fi and horror credits to his name, including House of the Damned (1963), Witchcraft (1964), The Earth Dies Screaming (1964) and The Watcher in the Woods (1980). Essentially, average director and writer producing average work. Again, not necessarily gems but not bad films either. The Day Mars Invaded Earth is certainly worth checking out. You could do a whole lot worse but the fun factor is admittedly a little on the low side. While there is a version of the film available for free on YouTube, it is virtually unwatchable because of the poor quality due to the shaky image that will leave you sea sick. Therefore, I suggest you check out the brand new DVD-R release from the 20th Century Fox Archives collection. A little pricy but if the image is the same one I saw on FXM (Fox Movie Channel), which it probably is, then I can certainly recommend it. Science fiction author and University of Kansas professor James Gunn interviewed a series of science fiction authors for his Centron film series “Science Fiction in Literature”. He sat down with the legendary Rod Serling in 1970 and, while it was never finished due to rights issues, the “lost” interview is now online for all to see and enjoy. In the same film series, James Gunn interviewed another legend in Forest J. Ackermann. Here are some rare film outtakes from that interview. Sure, the sound is missing but the visuals will surely excite any true sci-fi fan. Tom Leahy was one of the original television horror hosts. His character, called simply “The Host”, was enjoyed by Wichita audiences on and off from the 50s on to the 90s. There are a lot of rare clips now available. The raw film footage from Tom Leahy’s unfinished late 60s pilot film Green Hell from the Void is now online as well. We may never know much more than we do now as time is taking away those with the information on this rare flick. However, the pure enjoyment factor remains for future generations to enjoy and wonder what could have been. In 1983, ABC television produced a monumental sci-fi film called The Day After, which just happened to be filmed in and around Lawrence, KS. Here is a rare Australian documentary that takes us back to a very different era. And, of course, there is the man himself…Gunther! 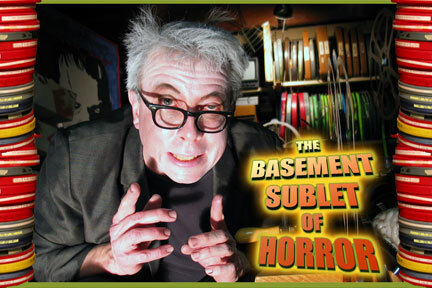 Countless episodes of The Basement Sublet of Horror are now online for all to enjoy. 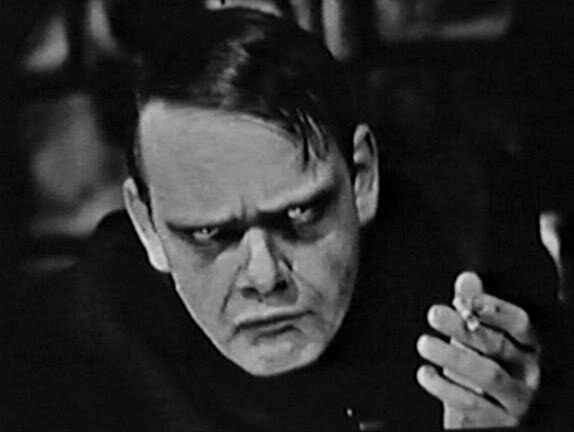 Early episodes were edited film parodies of the classic sci-fi and horror films we all enjoy. Personally, I enjoy these so much more than the Mystery Science Theater 3000 Check out Bucket of Blood and The Beast from the Beginning of Time for starters. I think you’ll really enjoy the Tom Leahy film as it also includes a lot of cool and rare extras. And that’s just the tip of the iceberg. Take the time to browse around his offerings. I guarantee you’ll find something cool and entertaining. And thank you Joel aka Gunther for all the hard work you’ve been doing in uploading this incredible film library. Back in August 2013, I published my first article on the rapidly decaying Joyland Amusement Park in Wichita. That article would then be published in the second issue of the Basement Sublet of Horror magazine last fall. Then, back in February, I gave an update on the discovery of the long-lost Louie the Clown. Now, it’s time for the final chapter in the Joyland saga as the park is finally being torn down. Piece-by-piece, Joyland has been disappearing for years. Arson has destroyed several buildings, theft has robbed it of memorabilia and Mother Nature has reclaimed the rest. The park has become an eyesore and a danger to the local community. 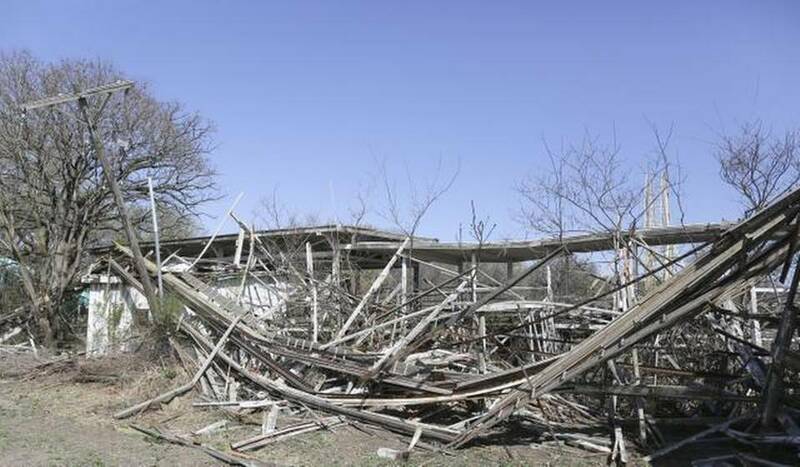 For years, a group reportedly attempted to raise money to purchase Joyland but had no success. Joyland had become too dilapidated and the cost to purchase it was too astronomically high. Factor in the costs to actually restore it and you had a money pit the size of Godzilla. In the end, it was a combined effort from Mother Nature and the Wichita courts that put the final nail in the Joyland coffin. Since March 2014, the Nelson family, owners of Joyland, and the city of Wichita have been in the municipal courts in a case that ultimately decided Joyland’s fate. On March 31, Margaret Nelson Spear pleaded no contest to failing to keep the premises free of litter and leaving a structure open to unauthorized access. Sentencing will occur on June 2 where Margaret will likely be fined. So now, the demolition has started. Many had hoped Joyland would reopen but those looking at the park without nostalgia clouding their vision have known for years that it was a dream never to see the light of day. The Historic Preservation Alliance of Wichita and Sedgwick County has purchased many pieces of the park and just recently purchased the front of the legendary Whacky Shack. They are also in negotiations to purchase some of the roller coaster cars and track. On April 3, a severe storm hit Wichita, leaving behind much damage. For many years, people were afraid of the roller coaster toppling down due to years of neglect. Sadly, that is just what occurred. Thankfully, nobody was injured. But it was symbolic of the end now facing Joyland. Personally, I think Joyland could have been saved when it was shut down in 2004 but the selling price was beyond reasonable. You had members of the local community willing to work for free to help restore Joyland but Margaret Nelson Spear wouldn’t think of it until she sold the park. In the end, that greed has left her family on the losing end of a court case. After paying the high costs of demolition and for clearing out the property, they will ultimately receive a lot less for the land itself as its not prime Wichita real estate anymore. For many Wichitans, time has taken away another part of our childhood. I have fond memories of Joyland during school outings and family trips. My favorite was always the Whacky Shack, proving that I’ve been a monster kid most of my life. Yet, I also remember the sadness when I saw the state of the park in the summer of 1998 when my family attended the annual KFDI event. I am glad the end has finally arrived. Joyland has been robbed of its dignity for years. Now, the voices of the past can finally rest. It’s always fun discovering a rare film. The type of movie that isn’t readily available, either because of rights issues or the simple fact that the film is an atrocity. 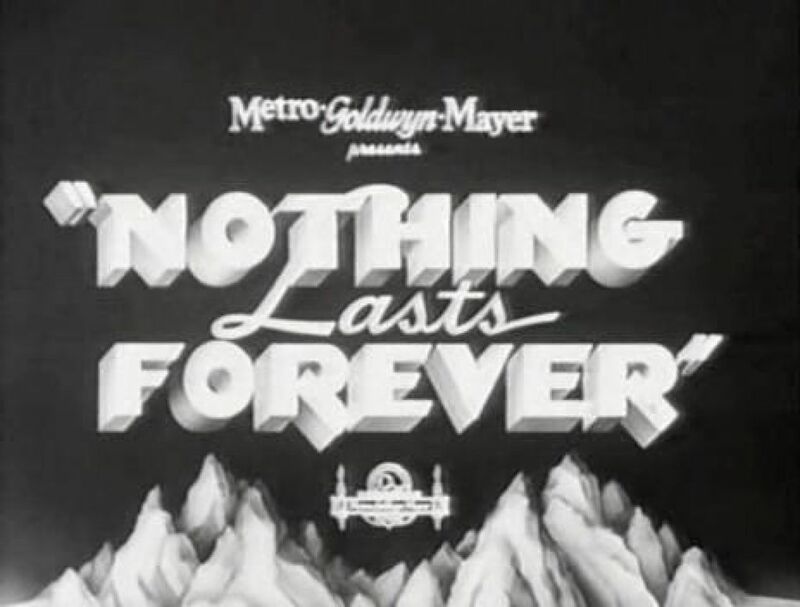 Several months ago, Turner Classic Movies presented what appears to be the North American television debut of one such film, Nothing Lasts Forever (1984). With a cast that includes legends like Bill Murray and Dan Aykroyd, is this movie a classic waiting to be discovered or something better left in dust bins? The movie stars a young Zach Galligan, fresh off of Gremlins, as Adam Beckett, an aspiring artist. In the opening scene, we see him apparently playing the piano like only a true concert pianist could. However, once he reveals that it is only a player piano, the appreciative crowd quickly turns on him. He escapes to Europe where, after explaining he wants to be an artist, he receives encouragement from an architect on a train. He decides to return to America. However, upon his arrival at New York City, he discovers that the Port Authority now controls it, along with everyone there, in an almost totalitarian state. The tale unravels much like a Terry Gilliam film might, just with less color and eccentricity. 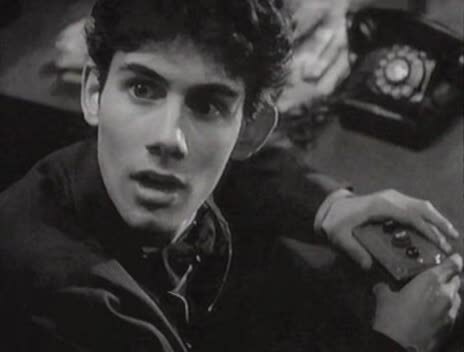 For starters, the film is almost exclusively in black and white. It’s presented much like a film noir of sorts as Adam discovers that the city’s tramps are secretly in control of the world. They give him the mission of traveling to the moon, finding his true love and spreading world peace. Appearances by such stars as Dan Aykroyd (Adam’s boss in the Holland Tunnel), Bill Murray (the moon bus conductor) and Sam Jaffe (mysterious underground leader) are what really make this film a novelty, not to mention the color sequences underground or on the moon ala The Wizard of Oz. The film’s more exciting story is the history of its release and availability. After a screening to MGM Hollywood executives, the movie was shelved. It was never released theatrically nor has it ever been made available on any home media. It has been shown on German and Dutch television, contributing to the bootleg copies circulating amongst rare film collectors. In 2011, one such copy found its way to YouTube, where it apparently survived until a 2014 online article discussing the film essentially alerted Warner Brothers (now the film’s owners) and, not surprisingly, the film was quickly pulled. A brief clip in the Holland Tunnel featuring Zach Galligan and Dan Aykroyd is still available as is a fan-made trailer (not bad considering the poor quality). However, the film has circulated in various film festival screenings over the last decade or so. Then, in January 2015, it aired on Turner Classic Movies. While Warner Brothers claims rights issues are preventing its home video release, airing it on television seems less complicated. Personally, I found the novelty and rarity of the film ultimately more appealing than the film itself. It wasn’t bad but I also wasn’t overly impressed. While Lorne Michaels and Tom Schiller created something that would have been a fun skit on Saturday Night Live, it seemed to really be stretched thin for a film with a running time of 82 minutes. While I won’t be adding it to my personal collection, I am glad to say that I’ve finally seen it. Podcaster extraordinaire Terry Frost reviewed this film over at the Paleo Cinema podcast in episode 59 way back in 2010. Go check it out and tell him Monster Movie Kid sent you. Then, begin your search of the dark corners of the internet to see if you can find a copy of the film. It’s certainly worth the journey if for no other reason the fact that the powers that be are trying to keep it from you. That always seems to make the viewing experience that much more fun.